We will first go to our Native Plant Database, scroll down the page to the Combination Search, and select Wisconsin for State and "vines" for Habit. Since we do not know what the sunlight is where you wish to plant them or what soils you have, we will just check the USDA Plant Profile on each vine we select to make sure it will grow in the area of Dane County, which should ensure that the soils, climate and rainfall are appropriate for that plant. You will need to follow each plant link to our webpage on that plant to check the growing conditions, light requirements, etc. This is not very many, but all we could find for southern Wisconsin. If you have difficulty finding the plants you want, go to our National Suppliers Directory, put your town and state or just your zipcode in the "Enter Search Location" box and click on GO. 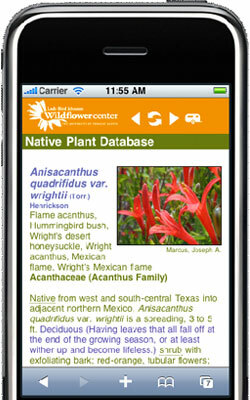 You will get a list of native plant nurseries, seed companies and consultants in your general area. All will have contact information so you can check their stock before you go. None of the vines we selected had any indication on our webpage that they were poisonous, but you should still search the below databases, using the scientific name for each plant, such as Vitis riparia. We would suggest that you also check with your veterinarian to make sure some locally-grown plant has not shown poisonous characteristics. June 01, 2014 - Is Phyla lanceolata, also called Fogfruit, Lanceleaf Fogfruit, or Northern Fogfruit, toxic to dogs? We have it growing amongst our grass. I can't find it on any toxic plant list. Are banana plants poisonous to dogs in Metarie, LA? May 25, 2011 - Can a dog die from eating a banana plant that I have growing in my yard?